I first saw FP's FINO skate shoes in a video by YouTube channel, Braille Skateboarding, titled, THE FIRST EVER NON NEWTONIAN FLUID SKATE SHOES!? Ordinarily I wouldn't mention Customer Service but I can't let the lack of communication on my order slide. FP's website says to expect delivery within 7-14 days of your order. After close to two weeks, my order was still marked as being processed. I sent an email asking for any kind of update, to no response. A day or two later my order was marked as completed but still no signs of shoes in my mail? About two weeks later (just over a full month of placing my order) the shoes arrived. I'm sure there was a reason the order took so long (I heard shoe stocks ran out in their US warehouse and orders were being filled from the international warehouse) but to not either respond to a customer inquiry, or let people who've placed an order know about any delays, is very poor customer service. 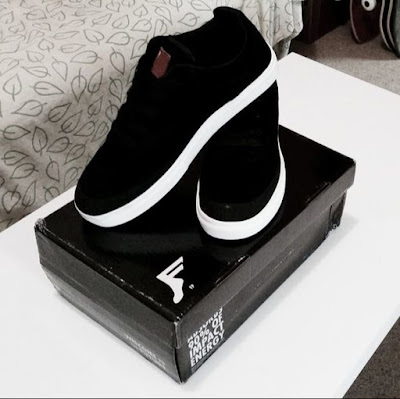 If you want to know all the technical specs of the shoes visit the product page on FP's website. It includes a video explaining how the DGS Outsole System works with their FluidX, Non Newtonian Protection, and Kingfoam insole. My first impression was the design looks pretty nice but white laces is way more photogenic and balances better with the white outsoles. So I immediately replaced the black laces with white sports laces. Of course this is entirely optional but I find myself filming and photographing my feet in skate shoes a lot. White laces make for a better photo in my opinion. FP FINO's photograph so much better with white laces. Walking in these shoes feels fine. A little bit harder than my ES Accel OG Skate shoes that I'm currently wearing but otherwise okay. Getting on my skateboard and rolling around I was not expecting to feel every single vibration of my wheels from my driveway. In my initial test I only did warm up skating, for about 20 minutes, before it got dark (it was a long day so it had taken a while to get to trying the shoes out). The vibration coming through the board, the shoe, and to my feet was excessive. I was still feeling the afterglow sensation of it the next morning. I wasn't sure if that was a good or bad thing so I decided to wait until I had more time to really try the shoes out. ​Watch my video review below. I've been skating the shoes for over a week since I recorded my video review. In that time my feet have overcome the vibration issue. It no longer seems to be an issue. I've also noticed that I do actually get some vibration into my feet wearing my ES shoes so maybe it was just more noticeable on the Fino's because I was initially focused on how the soles performed? Beyond that I feel the shock absorption system is superior to other shoes I've worn, including my ES skate shoes. It doesn't stop you feeling the impacts but it does seem to reduce the after affects somewhat. For me that translates to less foot and ankle bruising from just basic skating... so far. I feel, I won't be able to say for sure until I've really worn the shoes for a few months, and seen how often I've had to ease off skating due to foot bruising. The sides, and specifically the area around the toe that gets worn from ollies, feels solid and grippy. I had no issues there. The only concern I have with these shoes is that the under sole feels thin. Ninety percent of the time I wear through under soles first in all my shoes because I walk.. a lot. Time will tell if the tread is deep enough to last. From what's shown in the company's video of the soles construction I do have my doubts. Overall, however, I would recommend these shoes. They look great (especially with white laces), they feel comfortable to wear, and the level of foot protection, including the shock absorption system seems to be among the best. If you do have problems with constant, minor foot and ankle injuries these are well worth a try.